Reverend Barber is seriously litigious these days. Suing the state, suing Wake county schools and sheriffs and now has subpoenaed* the Voter Integrity Project. Why? Because shut up. That’s why. So, the Reverend wants to silence a group digging into election and vote fraud in NC, but is silent on his ties to fast food strikes, NC HEAT and the NC Vote Defenders. Shutuppery in full effect. When is someone going to sue the good Reverend and the NC NAACP for some transparency on all the groups he might be funding? When is someone in our media even going ask questions about it? Never. Go chip in, help defend Voter Integrity. So, we’ve come full circle back to North Carolina and the NC NAACP driven Moral Monday. 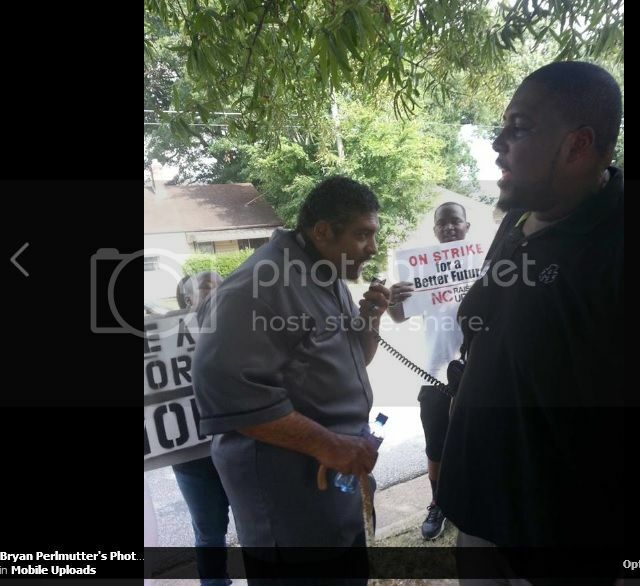 It should come as no surprise to you that Reverend Barber has attended these fast food strikes organized by NC Raise Up. We keep seeing the same players in North Carolina over and over. They keep forming new front groups, yell a new message in an attempt to stir the pot, and try to create the illusion they are a large movement or majority in NC, but in reality it is just the same small collection of Leftists doing it all. Screen Cap taken from Facebook Album of Bryan Perlmutter. Note the caption that this image was grabbed from a Facebook photo album of Bryan Perlmutter. There is a second photo of Barber there. This is the same Bryan Perlmutter who has supported union founded FLOC, is a member of the NC Student Power Union. Idocumented that he was arrested as a member of NCSPU along with Molly McDonough during the May Day 2013 protest. Perlmutter is now leading the NC Vote Defenders and which is funded by an unnamed 501(c)3. So, if you meet an NC Vote Defender at a polling area maybe you can ask them yourself who is paying them to hand you propaganda leaflets. Update: related NC Vote Defenders article at Carolina Journal. * Post Updated to clarify a subpoena was issued versus being sued. This entry was posted in BlueprintNC, ELECTIONS, LL1885, NC NAACP, The Articles, THE LEFT, Voter Fraud, Voter ID and tagged NC Heat, NC Vote Defenders, Reverend Barber, Voter Integrity Project. Bookmark the permalink. Thanks for the post, LL. While “sue” is too big a word, “subpoena” makes it look like nothing; so we call it “legal bullying” or “legal harassment.” Either way, we have to raise $ to avoid jail…so it feels just like a lwasuit…only it’s (supposedly) cheapter!